Last weekend, my husband and I did something new for both of us: we wallpapered a wall. We learned a lot about measuring, cutting, and patience, and got to deeply respect the skills of professional wallpaperers. 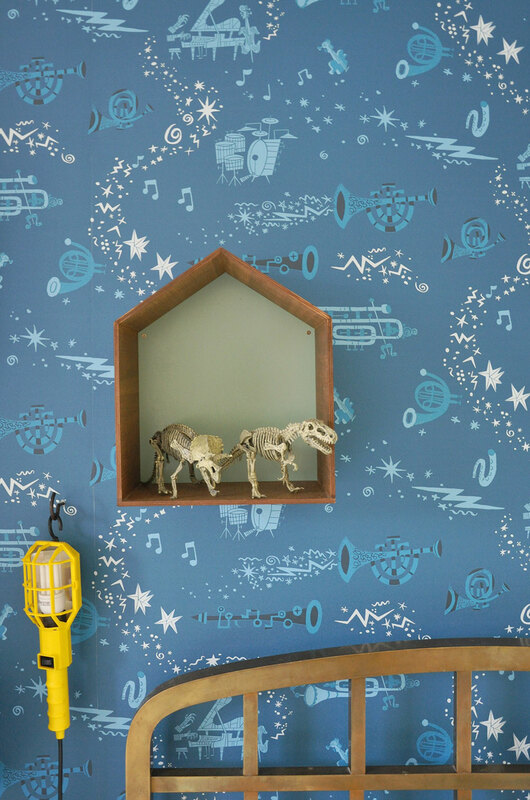 But after hard labour I’m proud to present the results: the wall behind Pim’s bed is covered in gorgeous blue wallpaper! Pim picked this design, featuring original drawings by the late Jim Flora, because he loves music and plays the trumpet. So it’s perfect. I love the quirkiness and originality of the wallpaper design, and the dark colour makes his bed really stand out. The bed is made of brass and antique, we found it in France last summer, stuck in a corner somewhere at a ‘Vide Grenier’. The plexiglass Star Wars sign was found on the street when we lived in New York 13 years ago, before we were married and had children. We stored it all this time, until we had sons who would appreciate it in their room! I found the bedside table on the streets here in Amsterdam, and it displays all of Pim’s little treasures. (He is such a hoarder!) The house shelves were an investment I made a few years ago for the old room, and we still love them. The badger rug is from Molly & the Wolf. Very personal room for Pim! Love it. Yes wallpapers can be tricky, even so the reward of it finished is so worth it. I prefer vintage furniture and selfmade shelves so this is a perfect child’s room! So fun!!! Love it, Esther. 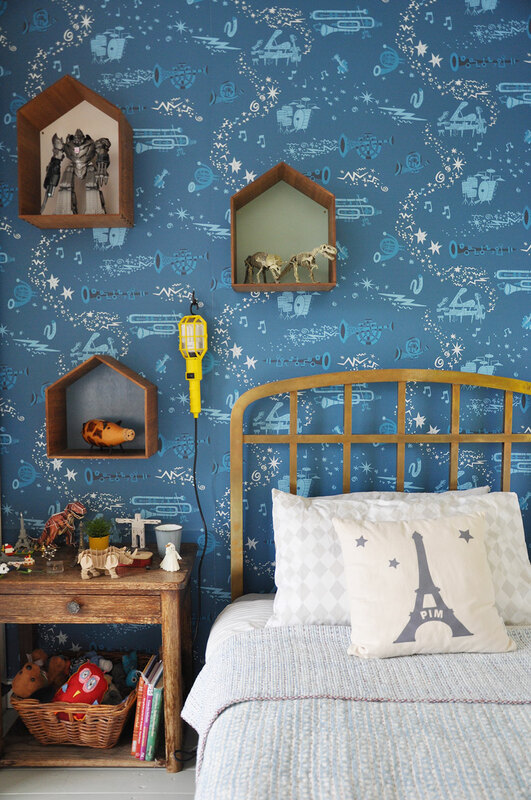 What a wonderfully creative and happy space for your son. looks lovely. could you please let me know where the yellow lights from too ? Beautiful work, Esther! Lucky kid! Definitely one of the coolest boy rooms I’ve seen! LOVE it. Great room for growing children! 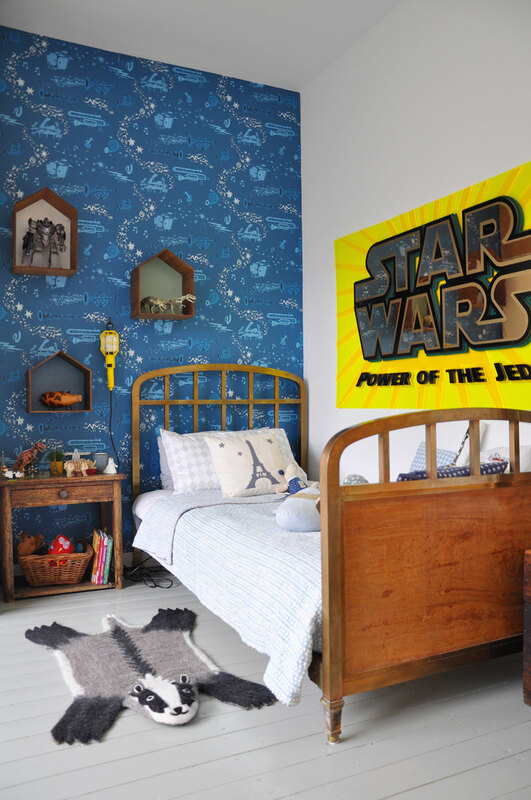 Can you tell me where to find the Star Wars poster?